Welcome to UBC – A Place of Mind. If you’re coming to UBC for your post-secondary education, you will appreciate this detailed and complete food guide for various food choices you have at UBC. Scroll to the bottom (edit – now placed it at the top) for quick picks and cheap eats at UBC. Whatever the cause, you can be assured without proper intention, you will be putting on weight in you freshman year. Make an intentional effort to eat healthy, exercise, and be mindful of how you are fueling your body for success. Enjoy the delicious UBC food bellow! There are plenty of food choices at UBC. You have eateries all across campus. A large amount of these eateries are owned and operated either by your student society (AMS) or UBC Food Services. There are also many private businesses congregating along the Nest, UBC Village, and Wesbrook. The list will be categorized by location for convenient sorting rather than by cuisine. Information provided includes (1) Price (2) Rating (3) Comments + Must-try/Avoid. 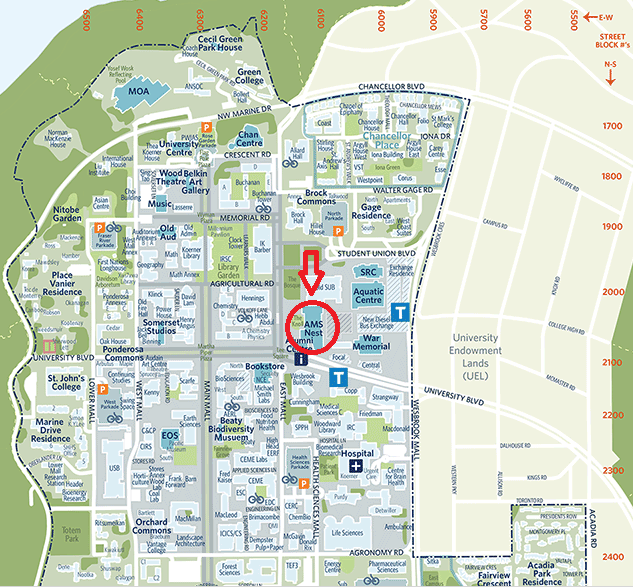 We are going to categorize an entire list of every possible food spot you can find at UBC campus. We will also share some notable eateries in neighboring communities to UBC such as Point Grey, Sasamat, and Kerrisdale. On UBC Campus: You’re not short on options at UBC campus for foods. You have everything from sushi to pizza. Most food places in the center of campus where the faculty buildings, research labs, and libraries are located, are operated by UBC Foods Services. There is quite a variety of foods but some similarities too. We will group these into “central campus”. The NEST and newly opened Central (besides the bus loop) also feature plenty of food options. There are a few UBC eateries on the outskirts of the campus, North and South such as Bean Around the World or The Great Dame Cafe. These are privately operated coffee shops located around the residential portions of UBC; we will list these under “Around UBC”. Finally, the other two spots you will find the most food choices are University Village and Wesbrook Village. Notably, the Save on Foods you will frequent often is at Wesbrook village which is about 20 minutes walk from the Nest or a 5 minute bus ride. There is a nearer, Shoppers Drug Mart where you can buy hygiene products, drugs and vitamins, and quite a food products (no produce) by the dentistry building which is no more than 5 minutes from the Nest. At the University Village, is also Granville Island Market (doesn’t actually have anything to do with Granville Island) that sells produce and essentials. We will use the Nest as a reference point of distance to any eateries mentioned as that’s most central to the new bus loop (hopefully skytain extension to UBC will be coming) and a popular gathering point for students. Unfortunately, with the departure of the SUB (replaced by the NEST), some popular and favourite dining choices have been demolish along with the old Student Union Buiding. This included the Korean food store in the basement of the SUB along with the popular Fridays, 50% off deal at the Delly. That was a bit of a discourse but I think our society today has become so self absorb. We don’t appreciate but are quick to judge public servants. We often take a militant approach to any discontentment. Let’s be a more generous and gracious society. Here’s a map to the NEST if you need help finding it. GOOD – Flip Side: Serving hand-made hamburgers (often slow service) in the lower concourse of the NEST. Find deserts, salads, fish n chips, and fried chicken too! Rating: 3/5 => Average food quality but great prices. A full Flipside burger menu and menu options is available here. Address: Lower floor of NEST @ 6133 University Blvd. AVOID – Grand Noodle Emporium: This UBC Chinese food replaces Moon Chinese food in the (old) SUB. The Grand Noodle Emporium serves Pan Asian Cuisine which includes classic Chinese take-out, noodles including ramen, Southeast Asian food, and Thai food (Pad Thai + Thai Curry). It’s a little bit of everything Asian. Rating: 2/5 => Your experience depends on the day you go. Comments: Your average prices for ramen and Chinese take-out. I am a little skeptical about the wide range of menu offered (from Thai food to Japanese to Chinese). While variety is good, it likely means quality and freshness can suffer when all these added menu options and responsibilities add up. Reviews reflect that certainly. Take a risk if you want to but there are likely better dining options on UBC campus. A full Grand Noodle Emporium menu can be found here for your reading pleasure and finding food at UBC. Address: Lower concourse of the NEST, just opposite Flip Side @ 6133 University Blvd. OK – Palate: This is where you find vegetarian and vegan food at UBC. Healthy and seasonal food with vegan options. Palate UBC serves mostly sandwiches and made-to-order paninis. Palate UBC also has great gluten free brownies, vegan desserts, and often no line-ups for a convenient and quick meal. Rating: 3/5 => Quick lines and vegan food options at UBC. Comments: Palate at UBC has undergone a few changes over the past two years. It use to be predominantly a vegan food option at UBC however shortly introduced more varied options including meat items. They now serve excellent sandwiches, wraps and made to order paninis along with a variety of delectable fresh salads, soups, and desserts (which includes vegan and gluten-free options.) It’s not by any means a vegan restaurant at UBC but they do provide a size-able variety vegan options. You will especially like their emphasis on fresh and local ingredients as near as the UBC farm. Palate is one place you can find healthy food at UBC. A full Palate UBC food menu can be found here subject to seasonal updates. Address: Main Concourse of the NEST @ 6133 University Blvd. Opposite the elevator on the exit besides the #4/14/9 buses. Right besides UBC CheckOut grocery store. GREAT – Honour Roll: Yes, that’s the Canadian spelling of Honour serving sushi at UBC. Some students really love their sushi (including me during my undergraduate) and have it everyday of the week! Price: $ => $3.95 for smoke salmon roll. Rating: 4/5 => As far as UBC sushi is concerned, it’s good. Address: Corner of main concourse of the NEST towards the North exit @ 6133 University Blvd. GOOD – Pie R 2: They serve delicious pizza with a variety of unique choices like cheeseburger or buffalo chicken and the classics like pepperoni, Hawaiian, and cheese. Rating: 3/5 => Reasonable pizza. Address: Right besides the South entrance of the NEST opposite Checkout grocery store @ 6133 University Blvd. Ok – The Pit: This is where you find many drunk college students on Wednesday nights. It’s also where you can go and grab a bite during the decent hours. Mainly the food you would find at a local neighborhood pub. (Nachos, Appetizers, Soups, Salads, Sliders.) They also feature a variety of local craft beers and alcoholic/non-alcoholic drink options. Price: $$ => $9 for 3 pork sliders. Rating: 3/5 => Reasonable UBC food. Not something you’d eat daily but the occasional finger food or salad. Comments: A convenient spot for get together among university students. This is one of two licensed venues at the NEST with the other being the Gallery. It’s not really been my thing; it’s in the basement and dark. You would be better off enjoying food at the Gallery with a cold one (or two.) I personally don’t drink. Address: Lower concourse of the NEST opposite the convenience store @ 6133 University Blvd. AVOID – P.H. Tea: AMS has caught on the bubble tea craze and added their own rendition of bubble tea at the NEST. Prices are what you’d expect for boba however the quality is sorely lacking. Perhaps, it just needs to be fine tuned a little bit over time…add bubble waffle and you probably have a winner. Rating: 1/5 => Needs work. Comments: While students may appreciate grabbing their bubble tea conveniently at the NEST instead of walking to the village for Pearl Fever UBC…it doesn’t hit the high standard for many students looking for bubble tea at UBC. The bubble tea needs some work, a lot of work (tea flavor, boba, and customization.) …service is good though. Address: North entrance of the NEST, besides Honour Roll @ 6133 University Blvd. Comments: Great place to get good coffee, support our local AMS, and enjoy some delicious albeit overpriced cookie (but then, what isn’t overpriced on UBC food? Franchises!) Service can be hit and miss. Address: Centre of main concourse at the NEST @ 6133 University Blvd. Central Campus: Here entails all the faculty building dining spots including two student residents dining halls/cafe, one Starbucks franchises, and two Tim Horton franchises. Comments: Great coffee, good service, overpriced pastries. University Village: Officially known as University Marketplace, University Village is just a 5 minutes walk from The NEST and right besides Regent College. The village as it’s also otherwise known consists of private rental apartments, a basement food court, and retail shops ranging from dry cleaning to printing services; but what we’re really interested in is the food! There’s plenty of UBC Village food choices here. Bubble Waffle Cafe: A Taiwanese restaurant on UBC at University Village. Food prices are very reasonable and especially their combos. Click here for a map of Bubble Waffle Cafe, University Village restaurant. Click here for pictures of Bubble Waffle Cafe that is available here. Click here for a Bubble Waffle Cafe menu that is available here. Click here for a map of Bubble Waffle Cafe, University Village restaurant. Pictures of Bubble Waffle Cafe is available here. A menu is available here. Visit Bubble Waffle Cafe on Yelp or Zomato for more feedback! Comments: Generally avoid Suga Sushi if you’re looking for good UBC sushi. The prices are comparable to sushi places on and off campus but the quality, freshness, and taste is far bellow standards. The Korean food is supposedly good but generally you will find better food on campus elsewhere. It is one of the few Korean restaurants at UBC. Comments: Omio Japan is by no means great sushi according to Vancouver standards. (We have over 600 sushi restaurants! You got to be good to survive.) However, if you’re looking for reasonable standards for sushi on campus served with exceptionally friendly service, then Omio Japan is where you should visit for your sushi fix. If you’re willing to trek a little off campus, then perhaps going to Ajisai Sushi or Hitoe Sushi would be a better choice. We’ve gotten Benny Fang, a ramen fanatic, to write his recommendations of the best ramen in Vancouver. Comment bellow if you agree with Benny’s recommendations for Vancouver’s Japanese ramen restaurants. Vegan food is often delicious, healthy, and animal-friendly. Even if you’re not a vegan, you’ll appreciate these tasty vegan restaurants in Vancouver, BC. Specifically, you’ve got to try the uniquely Vancouver vegan, Japanese-style pudding at Vegan Pudding & Co. mentioned on our list of Vegan Desserts in Vancouver. Yes, Vancouver has so many varieties of vegan food available, so much so, you’ll even find excellent eateries (literally a hole in the wall) serving just vegan desserts in Vancouver. 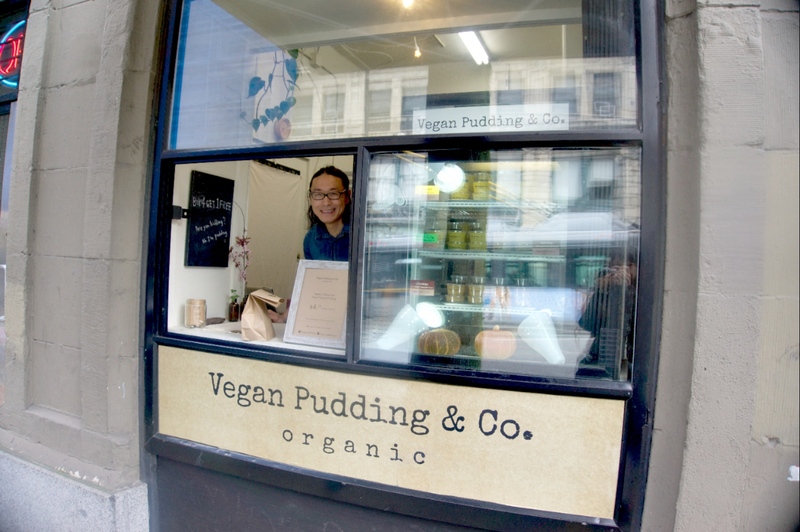 The Vancouver Vegan Pudding Co. (albeit expensive) is not to be missed. It’s not for no reason, Vancouver is one of the most vegan-friendly cities in the world as highlighted on HappyCow. Without further delay, don’t want to let you get hangry,…here are the five must-try vegan food you have to savor in Vancouver, BC. Certainly, it’ll appeal to those living a vegan lifestyle but even if you’re not into a vegan lifestyle…it’s a safe place to bring your vegetarian or vegan friends for lunch or dinner. This vegan restaurant is a popular favorite among vegans (and even the staunches meat eaters) in Vancouver. The Acorn conveniently calls home on Vancouver’s Main Street (known also as one of the coolest streets in North America). The vegan restaurant may seem unassuming, a corner store, but step inside this nationally renowned, vegetable forward, (+ vegan-friendly,) restaurant and prepare to be wowed. People travel to our amazing city just to try these delicious meals; we’re so thankful “The Acorn” has chosen to open shop in Vancouver of all cities spoiling locals with a unique, one-of-a-kind, vegan dining experience. The meals are made from fresh, locally sourced ingredients (WIN). Each dish is artistically designed and thoughtfully composed, providing diners a memorable dining experience and a symphony with their taste buds in each bite. Besides the great food, The Acorn is known as a Vancouver’s vegan restaurant that goes the extra mile with great service and a complementing dining room leaving patrons of this fine restaurant with a favourable all-rounded dining experience. Their specialty at The Acorn includes “Artichoke” – Southern Fried Artichokes, House Waffle, Pickled Shallots, Bourbon Maple Syrup, Mushroom Red-Eye Gravy. As you may notice, the menu at The Acorn carries simple names for their dishes with big flavors; it is often name after the predominant vegetable or component of the dish. Don’t miss the delectable vegan desserts as well at The Acorn. 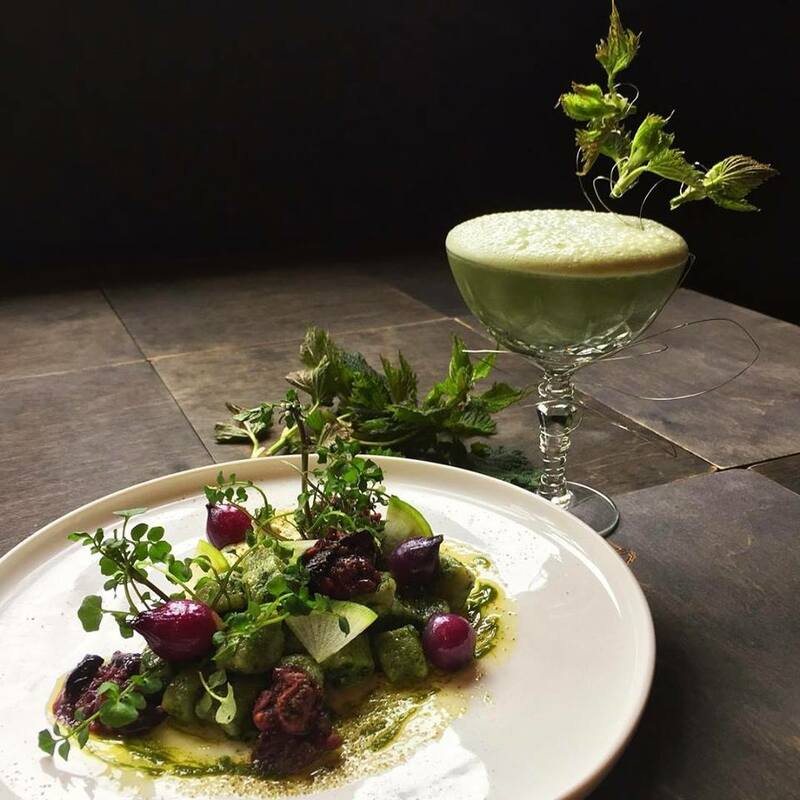 The menu at The Acorn changes seasonally and their chef, Brian Luptak, is consistently innovating, creating, and crafting new vegan/vegetarian dishes for their avid fans to enjoy (See their test dish bellow, Nettle). 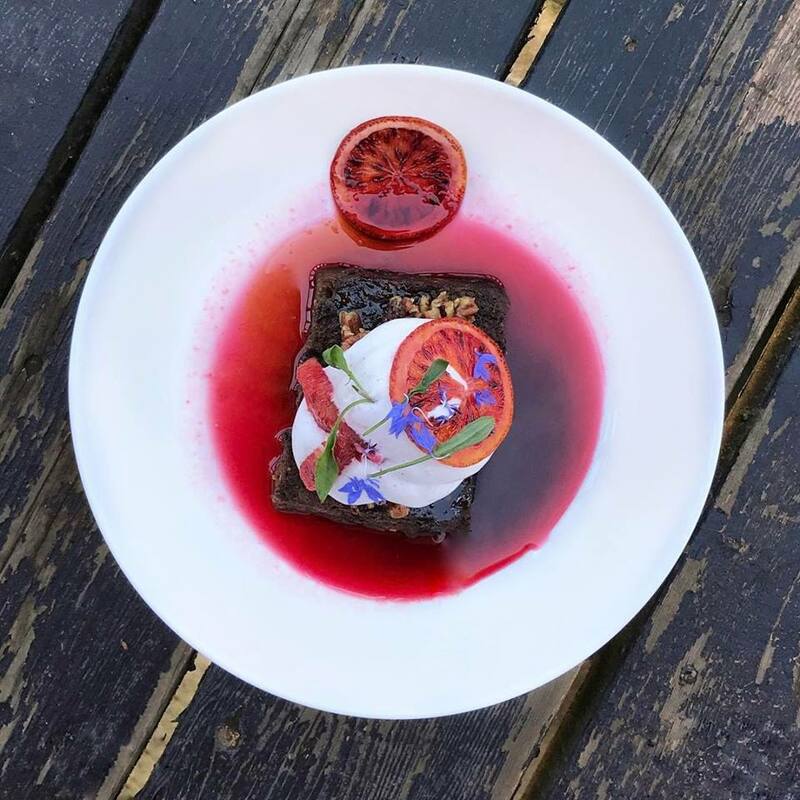 Take for example the recent new vegan dessert, “Coffee cake French toast, star anise mousse, blood orange jus, coffee syrup.” (the pictures do better justice than the description – check bellow.) The vegan restaurant is also infamously known for excellent cocktails to complement their vegan dining experience. Seasonal vegan desserts at The Acorn in Vancouver, BC. Brian Luptak, head chef at The Acorn is a culinary genius with artistic creativity who’s always investing new dishes for avid vegan Vancouver diners. Here’s a nettle themed dish they are experimenting. More delicious vegan food at the Acorn. Their dishes tastes good and consistently look terrific. These Vancouver vegan food are like works of art on the plate and on your palate. Get it only at The Acorn, Vancouver’s best vegan restaurant! A mainstay in Vancouver’s Vegan cuisine, MeeT on Main is a staple for many wholehearted vegans. MeeT on Main emphasizes on community-orientated atmosphere, friendly service, and neighborhood prices. Their specialty includes “MeeT Burgers” – delicious burgers made right, “Mac ’n’ Cheese with Vegan Cashew Cheese Sauce” – so creamy you won’t know it’s vegan, “Sweet Chili Cauliflower” – a great appetizer, “Nacho Fries”, and “Supergreen Salad”. Their vegan House Chili can also be added onto the Mac ‘n’ Cheese which is highly recommended favourite. If dining with a meat-eating friend, be sure to introduce “Hot Chiggin’ Things” – totally vegan with a big taste, and crunch. Everything on the menu at MeeT on Main is a winner. 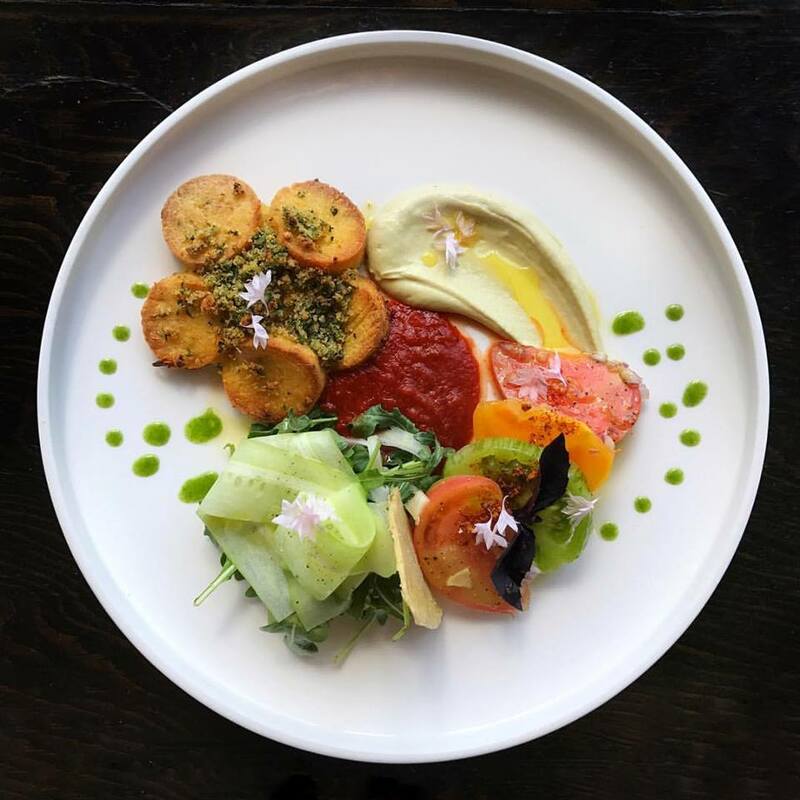 MeeT on Main is one of the leading Vancouver vegan restaurants to savour delicious food…even if you’re not vegan or vegetarian. In fact, half of their customers are non-vegans according to MeeT on Main’s owner, Ivo Staiano. You will find good food at MeeT on Main; it’s not pretentious, great value, and importantly, unbelievably tasty! MeeT on Main not only to provides great vegan food options but delicious comfort food for everyone to enjoy (that just happens to be vegan.) Give it a try today with your vegan friends. If you haven’t tried vegan food in Vancouver, then MeeT on Main would be the perfect introduction to a large variety of delicious vegan food options – that’s doesn’t at all seem to be missing any flavors or protein. If you’ve been a vegan all your life, then you likely already know MeeT on Main…their entire menu is vegan. You won’t regret giving MeeT on Main a try! Delicious vegan mac n’ cheese at MeeT on Main. A MUST-TRY dish at MeeT on Main in Vancouver, BC! A favourite at MeeT on Main, burgers! Crispy, double-fried fries with good dipping sauce. All vegan. Delicious vegan dessert at MeeT on Main to satisfy your sweet tooth. 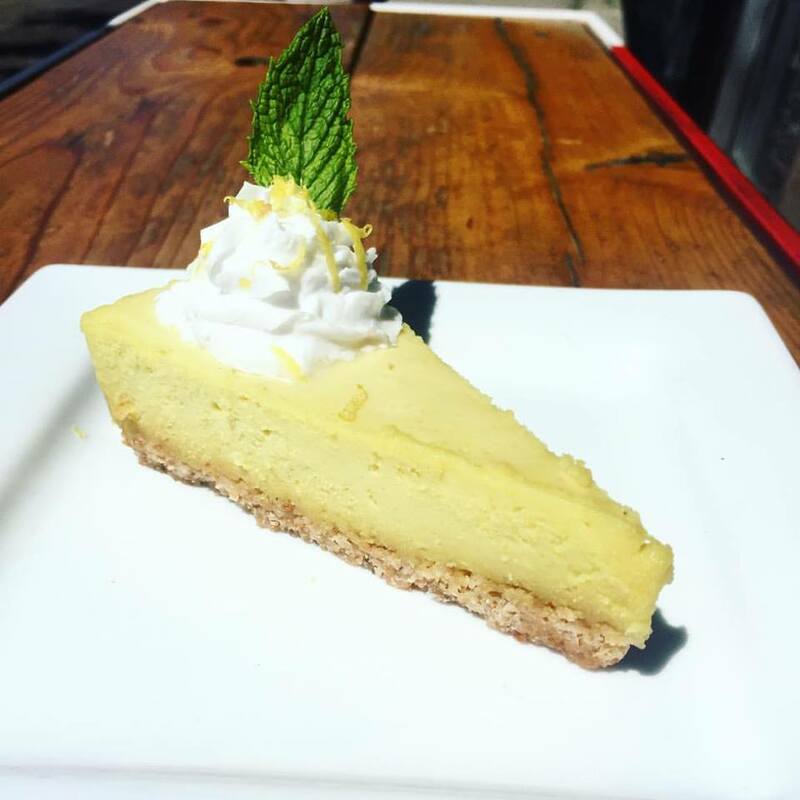 This is their vegan lemon tart that is an absolute must-try at MeeT on Main Vancouver vegan restaurant. The Heirloom Vegetarian restaurant in Vancouver, BC is another establishment frequently loved by vegans and vegetarians alike. This unassuming restaurant located in Fairview neighborhood, (for non-Vancouverites, the Fairview neighborhood is located about Broadway-City Hall Canada Line Station with West Broadway and Oak Street as the epicentre bordered by Cambie Street to the East and Burrard Street to the West. This neighborhood isn’t quite as hip as Kitsilano, you’ll find several redevelopments coming up along with a bustling commerce centre – plenty of offices and restaurants – about Broadway Street. Along with your friendly UBC students grudgingly commuting to UBC on the over packed 99 bus – of which I was one of them for four years! Thankfully plans are up coming for a Broadway sky train extension for the local community and students. Love Vancouver! What an amazing city with so many neighborhoods, people, mountains, water, and great artisan businesses. Sorry for that tangent; VancityAsks was created out of a genuine love for Vancouver, a believe that local businesses are the structure to our city, and people.) serves some of the BEST vegan and vegetarian food in Vancouver with an incredibly unique atmosphere that’s great for dining and meeting friends over dinner. Their specialty includes Heirloom’s “Tofu Ninja Bowl”. Some favourite vegan sides are “Gomae Salad”, “Beet Chips”, and “field roast sausage”. For dessert your options are limited but phenomenal, treat yourself to “The Brownie” which is a house made raw brownie served with avocado chocolate ganache…how luxurious. The avocado chocolate ganache especially sounds exceptionally tasty. For dinner, your vegan menu choices are more abundantly available with “Crispy Cauliflower” being a popular appetizer favourite. For your entree, the signature “The Heirloom” and “Veggie Supreme Burger” are good picks. The consensus among Heirloom diners is to avoid the avocado frites (just a fancy name for fries so they can charge you 30% more while making it seem justifiable and ensuring you think it’s worthwhile too). Unlike MeeT on Main, not all the menu items at Heirloom is vegan, although they are a vegan-friendly restaurant. Be sure to confirm with your server which items are vegan; likewise, this applies to The Acorn which is vegan-friendly but also a vegetarian restaurant in Vancouver. There are still plentiful delicious vegan options both at The Acorn and Heirloom Vegetarian Restaurant. The Heirloom Vegetarian Restaurant has a separate vegan menu whereas The Acorn vegan and vegetarian menu items are indicated accordingly with “V” for vegan. If you’re looking for delicious vegan fare, then the Heirloom Vegetarian Restaurant should certainly be on your must-try list next to MeeT on Main. These two restaurants are known for delicious food that rival any restaurants in Vancouver (vegan and non-vegan). A unique twist to vegan food; you don’t have to eat raw and tasteless food if you’re looking to adopt a vegan diet. A fair warning, the food at Heirloom Vegetarian Restaurant is pricey averaging $40/person, even more than the award-winning menu at The Acorn (although reasonable for vegan prices) hence why it comes in at #3 best vegan restaurant in Vancouver. What is notable about Heirloom Vegetarian Restaurant, is the nice decor and tasteful interior design that provides diners with a unique vegan dining experience. A nice place to meet up for dinner or brunch. 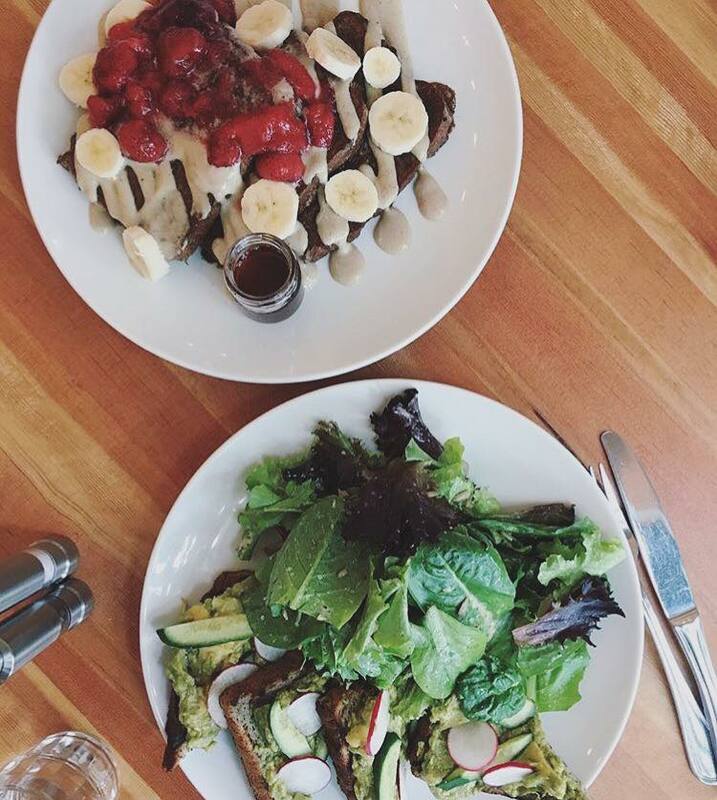 Two delicious vegan dishes from Heirloom Vegetarian restaurant highlighted includes their vegan french toast with banana and a generous serving of vegan salad atop avocado toast with radish for your Instagram colour variation. Fancy some vegan tacos? 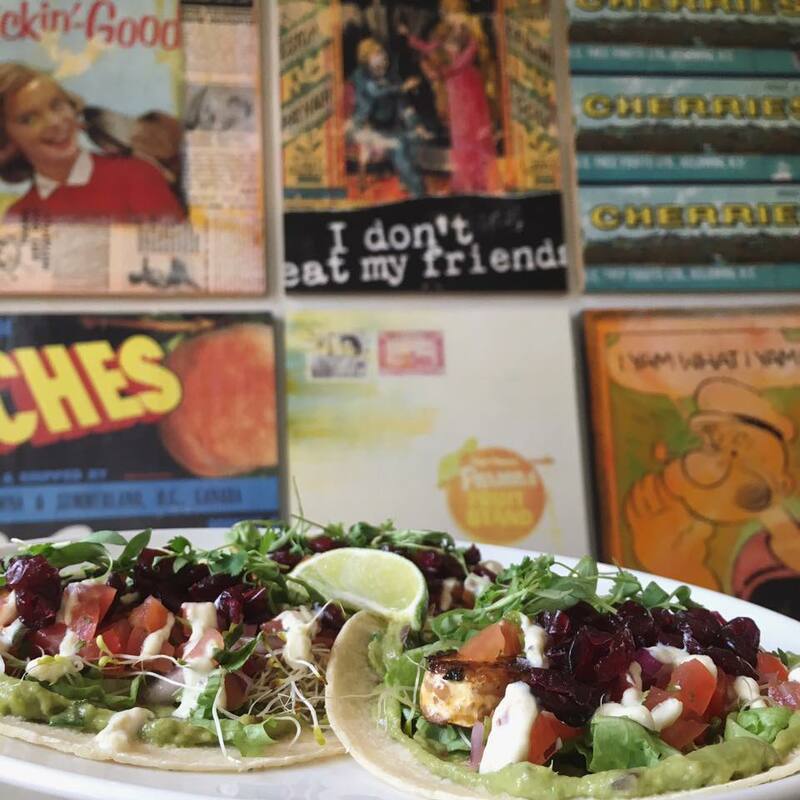 Find delicious vegan tacos at Heirloom Vegetarian restaurant in Vancouver, BC. Notice the backdrop of their unique interior design too! Delicious new vegan desert at Heirloom Vegetarian Restaurant. 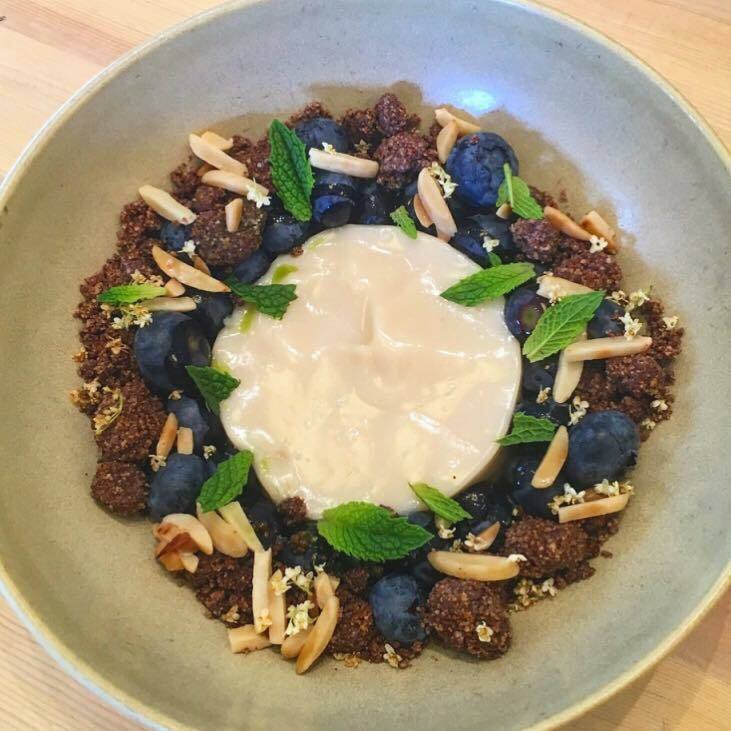 Almond pudding with fresh blueberries from UBC Farm! YUM! Happen to be craving Ukrainian food but also looking for vegan eats? We got a place for that in Vancouver; one of the best places to be vegan in the world. The name, Indigo Age Vegan Cafe, doesn’t divulge much about its cuisine except that it’s vegan…and a really delicious vegan cafe it is. Known especially for their raw vegan food, Indigo Age Vegan Cafe has been a favourite restaurant for many vegans in Vancouver. Their specialties includes Ukrainian cabbage rolls, potato pirogues, and borscht soup with coconut cashew sour cream (cashew is a popular substitute for dairy with vegan food). Indigo Age Vegan Cafe is also especially known for their delicious vegan cheesecake (it’s also on our list for the best vegan desserts in Vancouver as well)! You would barely guess it’s vegan – great texture and creamy feel. If you’re looking simply to stop in for a healthy drink, they also have a vast variety of smoothies, quality juices, and fermented coconut (apparently a super healthy drink – not my kind of thing though, in Singapore we’d throw out a fermented coconut that tasted bad haha. They serve green coconut, freshly opened, all across hawker centers on the island. Singapore is also one of the top-ten most vegan friendly cities in the world…actually where I first tried vegan food while staying atop a vegan cafe – owned by an amazing couple!) Indigo Age Vegan Cafe is also undisputed to be the best vegan raw cafes in Vancouver (their “Miso Seaweed Soup” is a delectable raw vegan choice and the “Sun Portobello Burger” is a popular favourite). Not everything on the menu is raw such as their pirogues but they do have many raw choices available for vegans looking for a raw diet. Even for vegan dishes that aren’t raw, nothing is deep fried and cooking is made only with healthy oils (avoiding canola and palm oil – keep them for your car engine.) They also emphasize on using local and organic ingredients where possible; another reason why Vancouverites love Indigo Age Vegan Cafe so much. If you’re craving to taste good vegan cheesecake then head on over to Indigo Age Vegan Cafe. Their vegan high tea is also a popular favourite so too is the Ukrainian vegan set menu. Look to spend average about $30 per person (before tax and tips) for a vegan meal at Indigo Age Vegan Cafe making it slightly more pricey than other vegan restaurants like Meet on Main. Delicious rice rolls at Indigo Age Cafe. Great food in a small cafe right in downtown Vancouver. Colorful and good for you. 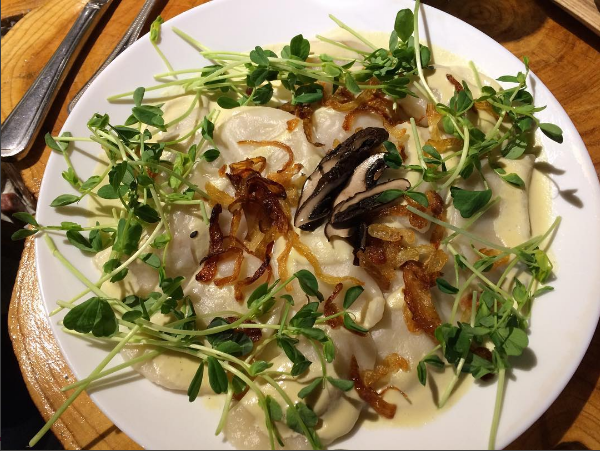 The popular vegan perogies at Indigo Age vegan cafe. They serve some of the best cheesecake in Vancouver but also specialize with Ukrainian-inspired vegan food in Vancouver. Try their vegan cabbage rolls, vegan borscht soup, or vegan perogies. 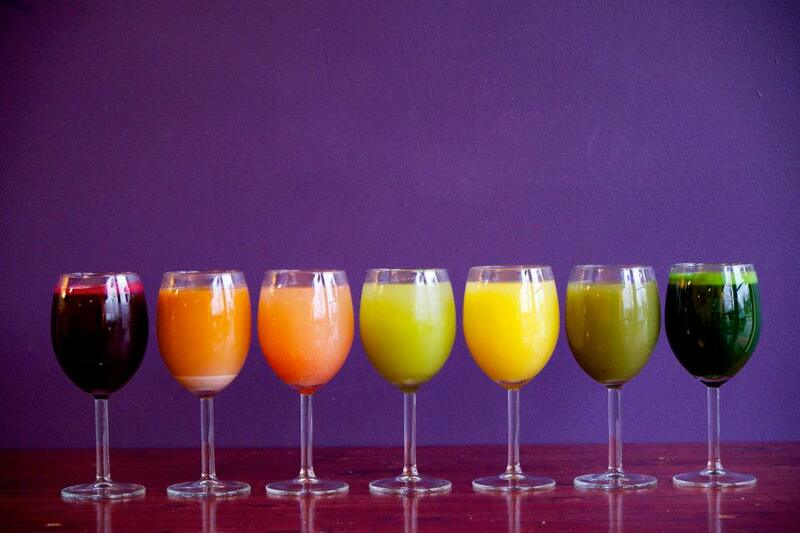 Did you know Indigo Age vegan cafe also serves up a large variety of healthy vegan-friendly juices and fermented coconut? Great refreshing drink with plentiful health benefits at this vegan cafe in Vancouver. Loving Hut Express is not really a Vancouver vegan restaurant but a Vancouver vegan food truck! (even better the way you look at it. Quick, delicious, non-pretentious vegan food that’s reasonably priced. Perhaps not sufficient to beat out Meet on Main but very good in its own right.) Loving Hut Express Vancouver is actually part of the international restaurant Loving Hut with HUNDREDS of location world wide especially in Taiwan (of all places eh?). They are so popular for a reason; the food is good and the prices are good. 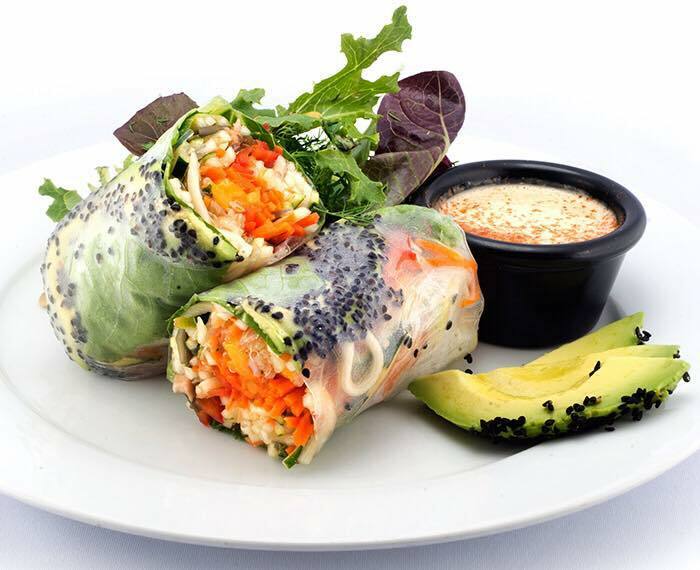 Their mission is to make the world friendlier with vegan and vegetarian food. At Loving Hut Express Vancouver, all the menu choices are vegan-friendly so you can enjoy your meal confidently that no animals were harmed in the production of your lunch. Their focus is especially on making food without any harm to animals, it’s not just vegan for a healthy diet at Loving Hut Express but I would presume care for animals and other vegan values. You’ll find delicious bites of vegan food at Loving Hut Express despite being dished out downtown by a street truck near Yaletown Roundhouse Canada-Line Station rather than an actual vegan restaurant in downtown Vancouver. This Vancouver vegan restaurant/food truck specialize mainly in vegan burgers offering gluten free options. Their specialty includes Chick’n Burger, grilled mushroom burger, teriyaki burger and even bacon cheese burger. It’s mouthwatering worthy – the food is delicious and flavorful. 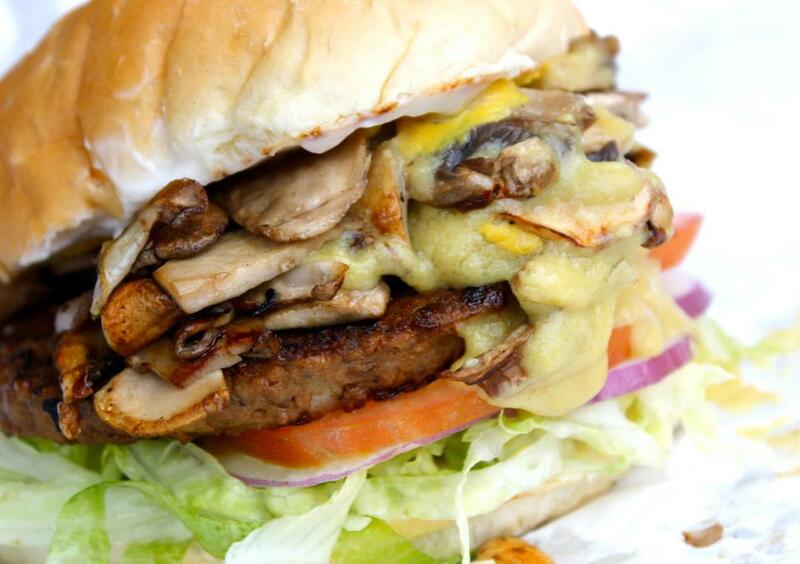 Many patrons have noted that the vegan cheese in the mushroom burger is exceptionally good. The burgers are also on-point with excellent vegan patties. It’s not for no reason that Loving Hut Express Vancouver has gained an almost five star rating among visiting vegan diners on yelp! There’s also a reason that Loving Hut has locations across much of the world in Taiwan, to Indonesia, to Brazil, to Toronto, and to Vancouver. It’s good vegan food! in Vancouver that you absolutely MUST try if you haven’t! (Its so good, I didn’t care about proper grammar with the extra exclamation point. Note the mistaken application of its as well; this is vegan food so good that it’ll leave you excited.) A fair warning that its cash only so bring those green plastic bills, so not to be disappointed. Loving Hut Express food truck is a convenient vegan/vegetarian spot in downtown Vancouver. If you’re looking for non-pretentious vegan food about Yaletown Roundhouse, Loving Hut Express, as its name implies is where you want to go for quick vegan food in downtown Vancouver. We would suggest that you give this international vegan restaurant (food truck) a visit and see what the hype is all about around the world. Loving Hut Vancouver is an international vegan restaurant chain (by franchise) that is infamously known for irresistible vegan burgers. Check out the vegan burgers from the vegan food truck in Vancouver! Hope you enjoy these Vegan eats! Vancouver is a city with plentiful vegan options available. According to HappyCow.com, a website solely dedicated to vegetarian and vegan restaurants across the world, there are 117 Vegetarian/Vegan-Friendly restaurants in Vancouver. However, the majority of these are not exclusively vegan restaurants catering predominantly to vegetarians alone. The list above features both vegetarian restaurants that are vegan-friendly and solely vegan restaurants in Vancouver. MeeT on Main, Indigo Age Vegan Restaurant, and Loving Hut Express Vancouver are fully-vegan eateries in Vancouver. The Acorn and Heirloom Vegetarian Restaurant serve both vegetarian dishes with vegan-friendly options available to diners. Sometimes, you’re dining with non-vegan friends and you want options to accommodate both vegans and non-vegans. If you’re vegan dining with non-vegan friends, these are a few excellent restaurants that provide extensive options for both vegan and non-vegan diners. These are not vegetarian restaurants in Vancouver…some do serve meat products but they are vegan-friendly with alternatives available for Vancouver vegans. 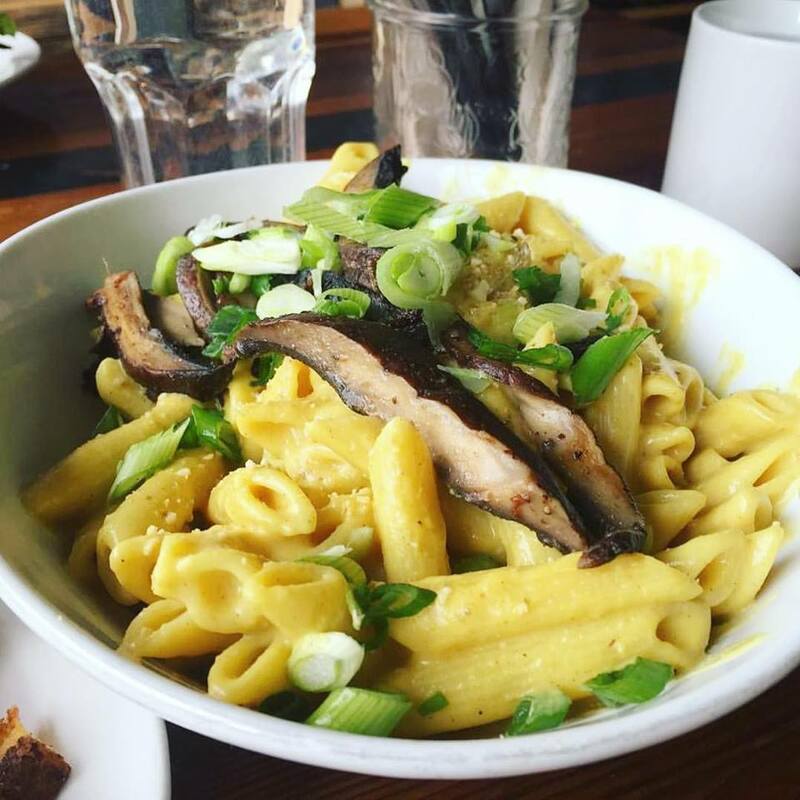 Hope you enjoy learning about these amazing vegan restaurants in Vancouver, BC! Thanks for reading. One more thing…When trying to find the best of anything (especially when it comes to food where tastes and preferences can vary), multiple opinions are preferred…so we’ve included links to Facebook, Zomato, and Trip Advisor for your convenience to confirm just how awesomely delicious these Vancouver vegan restaurants are! May 14, 2018 – Thanks to reader’s feedback, Virtuous Pie will be included onto our list on the next update replacing Heirloom’s restaurant. I always enjoy a good burger; it’s nutritious too and allows me to stay full and focused throughout the day. A worthy lunch and dinner option made even better with these stellar Vancouver eateries/restaurants. What Makes a Good Burger? In searching for the best Vancouver burgers, we’ve looked for (1) beef quality (2) taste and flavor (3) atmosphere. Among these three we Also looked for creativity, consistency, complementing ingredients and general guest experience. On the side we factored the value and location accessibility because Vancouver foodies will gladly drive a little further for good burgers. Hope you’ve enjoyed learning about the best burgers in Vancouver on VancityAsks. Please leave your comments, opinions, and feedback bellow. Do share as well what other burger joints/spots you frequent (great value or great taste). Please share as well what your thoughts on our choice of the top 5 burger eateries in Vancouver if you can! 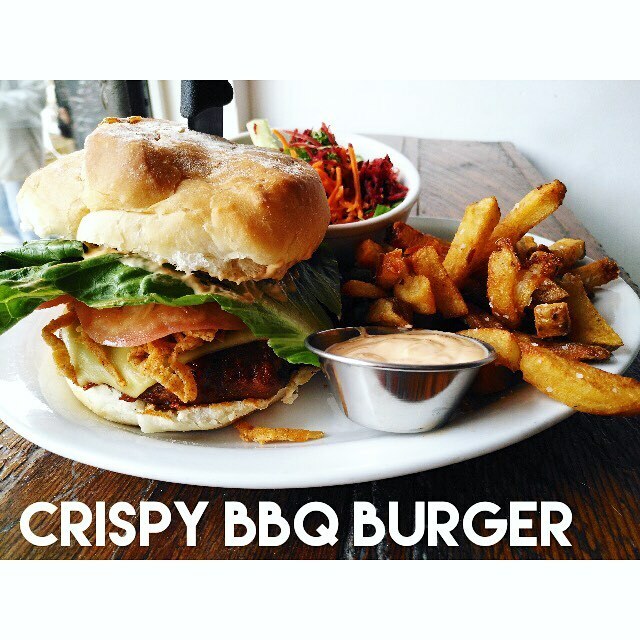 Thanks for reading our highlight of the best burgers in Vancouver. Knowledge makes our lives a little more colorful. In planning and writing an article on VancityAsks, we seek to educate ourselves on the specific topic matter if not already experienced (or find a local who is an expert in the field for such topic – thankfully more than happy to be well versed in most food related topics). In the process of finding the best burgers in Vancouver, we first sought to identify what is considered to be a good burger. The genesis of doing so, we took to learning about the history of burgers. Where did it sprout from? Why was it created? What was the original burger? Where do you find the best Ice Cream in Vancouver? Don’t miss these fabulous local ice cream shops this summer. We’ve considered local recommendations and online blog reviews to find the initial highlights then first-hand experience to validate our choices. (by the way, eating ice cream can be hard on your diet). We hope we’ve chosen correctly but your feedback and comments bellow will influence the list of the best ice cream in Vancouver on VancityAsks. The article is long but worth a read if you love ice cream. Bella Gelateria is an award winning ice cream shop nestled in downtown Vancouver, BC by Coal Harbor. They actually serve gelato which is the Italian word for ice cream. 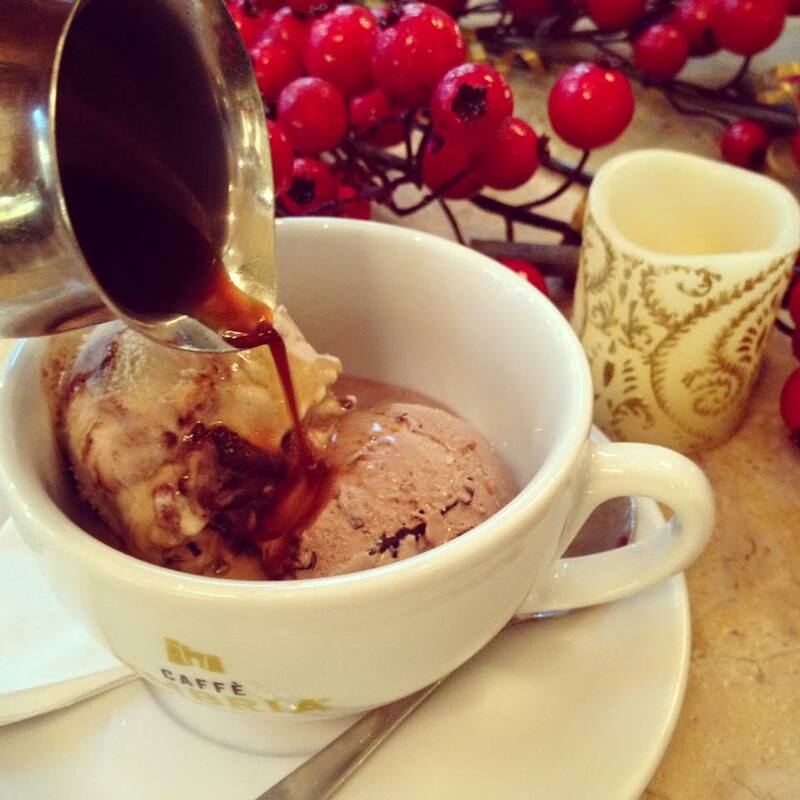 Traditionally, gelato is also made with lesser cream, no eggs and more milk while being churned slowly. The end result is, you get a creamy cool treat with less fat (per ml) that’s more luxurious and weighty because of the lesser air incorporated. Read more about the difference between Gelato and Ice Cream here. You taste the difference with Bella Gelateria freshly made, small-batch gelato ice cream in Vancouver, BC. Bella Gelateria is commit as well to using as many fresh and local ingredients as possible with no preservatives in their gelato. 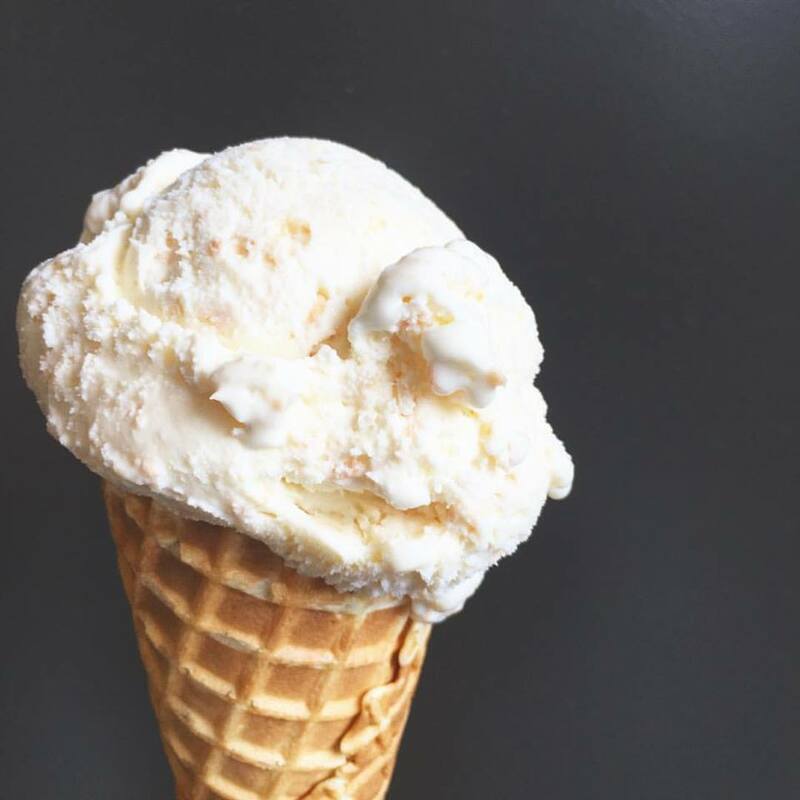 You’ve likely seen one of their many awards for their ice cream featured on the storefront by Coal Harbor with a line wrapping around the Fairmont hotel building. It’s definitely worth a taste if you’re looking for good ice cream in Vancouver or authentic Italian gelato. The price is comparable to any artisan ice cream shop in Vancouver setting you back $5.50 per scoop. (Outrageous pricing for ice cream but it’s truly artisan, quality ice cream in the heart of downtown Vancouver and the typical cost of good ice cream in Vancouver). If you have a celebration coming up, cakes are available at Bella Gelateria for $72 per 10”. Mention ice cream in Vancouver, and Earnest Ice Cream likely comes to mind. They’re rightfully consider by many Vancouver locals to be the best ice cream in Vancouver. Earnest Ice Cream started with humble beginnings as an ice cream trike back in 2012 selling brown paper wrapped, home-made ice cream sandwiches made by Ben. It evolved into an ice cream store shortly after. They are famous for artisan, home-made, FRESH (really fresh) ice cream; Earnest uses fresh and often local ingredients void of any preservatives or additives. It’s good old-fashion ice cream. Tangent: This is a rather interesting story; Earnest Ice Cream is unique. Ever wondered why Earnest Ice cream makes do without the traditional see-through displays? (Removing the visual selling point.) You’d typically hope to see what you may indulge with, wouldn’t you? Well, Ben and Erica are probably marketing geniuses! They want to emphasize on the story telling and the experience of their fresh and local Vancouver ice cream creations. They wanted their products properly represented I suppose. In an marketplace that leans more towards ethical consumerism and experiential buying (thanks to technology and millennials), Ben made the smart and purposeful decision not to display their ice cream so he could rely on his service personnel to narrate the ice cream to you…rather than the consumer judging by glances, you get the story of the ice cream – it’s about the experience remember? The premium ingredients, the process, and the taste. That’s marketing genius it seems but it also provides a more personable experience for customers so you can expect service and attention and an overall positive experience with your ice cream at Earnest. Interesting fact – It’s been proven that restaurants using descriptive words like “homemade” and “fresh” can raise the willingness to pay of consumers by 27%. With all the work that goes into their home made Vancouver ice cream, it well justifies the $5 price tag for a single scoop and $7 for a double. Many certainly think so because they have flocks of locals outside their shop every weekend of summer. Earnest Ice Cream is known for their rotating, unique and seasonal flavors. All their ice cream are made fresh on a regular basis; you can find the latest flavors available on their website. A sample of their current flavors includes “Vegan Mint Chip”, “Matcha Green Tea”, “Raspberry”, “Sour Cherry Goat Cheese”, “Whiskey Caramel”,“London Fog”, “Tahitian Vanilla”, and “Salted Cameral”. Another Tangent: Where did the name Earnest Ice Cream come from? The name Earnest Ice cream was inspired by Ben’s last name (another observation, many of the renown brands and businesses today are often the founder’s name isn’t it – is Earnest next? ); it was also chosen because the word “earnest” means honest and true which is what Ben and Erica hopes their Ice cream shop embodies. Honest and true Vancouver ice cream (not with the preservatives and fillers). The price tag is high for ice cream but certainly worthy for its quality. Rain or Shine ice cream in Kitsilano is a local ice cream shop that scoops up home-made ice cream made with milk from Birchwood Diary Farm. A theme with Rain or Shine is being environmentally friendly. Their objective is to reduce their carbon foot print and support locals hence all their ice cream is sourced with ingredients as close to the point of chaos deliciousness as possible. 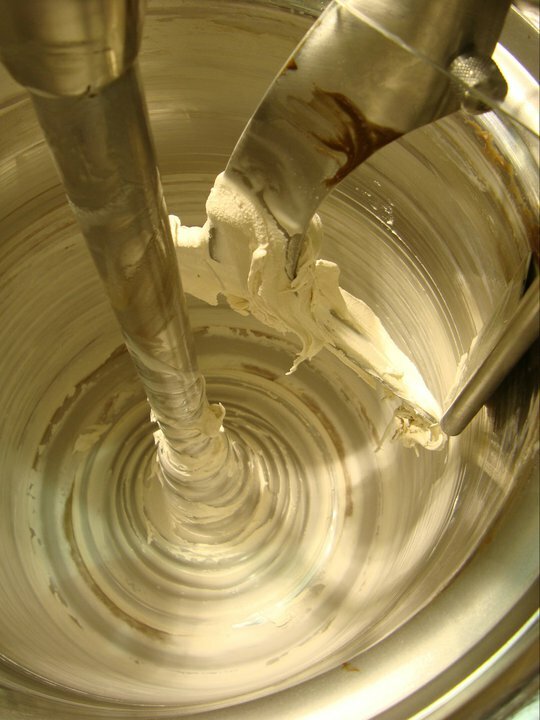 The ice cream produced at Rain or Shine is made fresh on a regular basis. You’ll notice an open kitchen concept with their stores so locals and patrons can view how their ice cream is made. Established in November of 2013, Rain or Shine is quickly becoming a Vancouver favourite in Kitsilano. We like their emphasis on community. Flavors at Rain or Shine range from Honey Lavender and Blueberry Balsamic to the classics like Peanut Butter and Salted Cameral. Rain or Shine ice cream emphasizes on friendly service at this Vancouver ice cream shop. Prices here are typical of good ice cream shops; you’ll find yourself spending about $4.50 per scoop. D’oro Gelato & Café is a gelato shop conveniently located on Robson street in downtown Vancouver once again. Arguably one of the most under-discovered ice cream shops in Vancouver, this gelato shop is a hidden gem. Locals and tourists alike enjoy the rich, creamy and authentic gelato. The gelato is “home-made” like your Italian grandma might do it (if you had one…) with some rotating flavors. Their gelato is made fresh daily in small batches with local and seasonal ingredients as usual of quality ice cream shops in Vancouver, BC. The history of this gelato and café shop dates back to 2000 with the help of a gelato expert otherwise known as a “Gelateria Artiginale. It’s as authentically Italian as it gets outside Italy and also one of the best ice creams in Vancouver whether gelato or not. D’oro Gelato & Café continues to follow the same standard of quality and artistic Sicilian practices with making their gelato today. The luxurious taste and quality is distinct with D’oro Gelato & Café matched with equally good service in a neat little café by Robson street. Don’t miss this Vancouver ice cream shop. Great service and good food with an unsurpassed atmosphere for an Italian café. The best for last right? They serve unique flavors of premium popsicles. It’s not really popsicles; it’s a complete cold-desert. Their “popsicle” is notorious not only for delicious flavor combinations but for having whole treats in that stick of goodness. Johnny freshly makes these popsicles himself. Much like Earnest Ice Cream’s beginning, is sold from an ice trike that roams around Vancouver. Flavors includes mini-donuts popsicle, chocolate brownies, peaches and cream, or fresh local berries concoction like blueberries. It’s often a simple favourite of many locals for a cool treat on a summer day. Unfortunately they are usually in North Vancouver which makes it a bit of trek. Finally had the chance to try their pops at #PopCrawl Vancouver; the chocolate brownie is more than a popsicle; you have chewy pieces of brownie, dark chocolate flavor, creamy base, and a pinch of salt. While it was given away free at PopCrawl event, you’d typically have to pay $3.50 for the tasty treat. A $3.50 popsicle may not be a favorable price-point however you can buy it for $2 with an app which is a worthy bargain. Address: Depends on where Johnny goes. Do you have a favourite that we missed? Share it bellow and have your say. This list will be amended base on feedback. This is one of my personal favourite ice cream in the Greater Vancouver Area. People who grew up in the tri-cities know that Rocky Point Ice cream is an establishment in the community. They are located in Port Moody by Rocky Point park, hence its name and they make their own ice cream fresh. The owners are very involved in the Port Moody community and are passionate about ice cream. They spent about a year travelling around learning how to make the best ice cream they can (including to Italy) then they came back and started crafting fresh ice cream for locals. They’ve perfected their craft it seems; the ice cream is delicious on a hot summer day. It’s packed during summer with a line as long as 10 meters around their newly renovated shop. The staff is friendly and very generous with their ice cream portions. Price is about $4-5 for one scoop on a waffle cone and had various flavors like salted cameral and chocolate. Once again as the ice cream is made fresh on site, the flavors do rotate regularly. It didn’t quite make it onto the list because it’s farther away from Vancouver, in Port Moody, BC. A nice tip: If you live in Vancouver downtown, catch the West Coast Express on a Friday (leaves at 3:50, 4:30, 5:30) which brings you right to Port Moody by Rocky Point Park and enjoy your ice cream, Pajo’s fish and chips, and the nice inlet before making your way back to Vancouver. It’s a relaxing and enjoyable trip on the WCE by the coastline of Vancouver; the tidal inlet is a spot where Vancouver residents HAVE to visit; there’s a nature trail by the coast line too. No introduction is needed for La Casa Gelato. This is the Chinese owned (I think?) gelato shop that spots over 200 flavors! I was impressed at the variety and the row after row of ice cream flavors displayed. You can taste a few and buy what you like most. The ice cream shop is located in Vancouver’s Strathcona neighborhood. While the ice cream is good, it’s mainly the experience of seeing over 200 flavors of ice cream (from Durian to black sesame) that draws patrons in. The Vancouver gelato shop is good but not necessary the best relative to D’oro or Bella. Mister is another liquid nitrogen ice cream shop in Vancouver’s Yaletown community. People say that the price at Mister is steep at $7 whereas the taste doesn’t necessary appeal to the masses. However, if you wanted to taste ice cream that Adele has enjoyed in Vancouver then Mister is the place. The UK singer shared about their ice cream she had on stage during her performance in Vancouver. Sooo…if you want a taste of what the famous eat when visiting Vancouver then perhaps Mister is your bid at $7 for a small cup of liquid nitrogen ice cream. Other than that, maybe not? 720 Sweets made its debut in Vancouver back in the fall of 2015 and wowed Vancouverites with their nitrogen ice cream. The theme with their ice cream shop appears to be pseudo-science (from appearance); from nitrogen ice cream to their modern drinks (you can choose varying levels of sweetness). The presentation is excellent though the taste is another; it is a worthwhile visit to experience the nitrogen ice cream but likely not a regular ice cream favourite in Vancouver. UYU Ice Cream is another must-try ice cream shop in downtown Vancouver, Gastown to be more precise. They serve soft-serve ice cream with a variety of toppings (something like Scoop! but actually done right). UYU means milk in Korean so you know it’s a little k-pop inspired (kidding). They boast that their ice cream is perfectly balanced, never too sweet (that’s a relieve) or creamy but fresh and delicious. What’s unique about UYU Ice Cream in downtown Vancouver is the soft-serve flavors; the use of organic milk with their soft-serve flavors such as “Vietnamese coffee”, “salted cameral” and “cereal milk”. They also spot unique flavor toppings such as black sesame powder. A standard soft-serve at UYU Ice Cream is priced at $4.75 which includes a free drizzle sauce. Red Rooster is the new kid on the block as far as Vancouver’s artisan ice cream shops are concerned. Their ice cream per usual of Vancouver’s artisan ice cream is made fresh with an emphasis on local ingredients void of preservatives. The owners begun the ice cream shop out of their love for ice cream and the interest with seeing kids smile (seems the common factor with good ice cream shops as you’ll find with Rocky Point Ice cream bellow). Thanks for reading about Vancouver’s BEST Ice Cream Shops! I hope you enjoyed exploring the best Ice cream in Vancouver together. Thanks for reading. Did we get it right? Comment bellow if you think we missed or messed up. It was a hard choice; we will still be switching things around base on feedback. (I think Johnny Pops should be on the top 5 somewhere but Red Rooster ought to stay in the roster as well). A random winner will be selected once we’ve approved 20 comments.